The Sensbox is our smallest vario with built-in GPS. This makes it the perfect companion for hike&fly and other weight conscious pilots. Its long battery life and the huge storage capacity based on SD cards make it a great backup device for cross-country and competition pilots. In connection with aviation apps on mobile phones and tablet computers, the Sensbox serves as highly precise data source, making the apps even more useful. In its unique logger mode, the Sensbox stores all its sensor values with high precision and speed. This is important data for test pilots, but also serve to augment sports videos of all kinds. The Sensbox either records this sensor data, or transmits it in real-time via Bluetooth Low Energy (BLE, Bluetooth Smart) to mobile phones and tablet computers, to serve as a data source for aviation apps. Starting with version 3 of the firmware, you can run the Sensbox either as a vario (in flight mode) or as a data logger (in log mode). In log mode, the Sensbox records all sensor data at high frequency (up to 50 Hz) for up to 24 hours. The data is stored as a CSV file, ready for processing in Excel or in a database. In addition, the file can serve as a data source for video tools like Dashware (for Windows) or RaceRender (for OS X and Windows). Data transfer to mobile devices (phones and tablets) uses Bluetooth Low Energy (BLE, Bluetooth Smart). The mobile device must support this standard in hardware as well as software (Bluetooth Smart Ready). The Sensbox Configuration Tool allows you to easily change the settings on the Sensbox, and adjust them to your particular needs. The transfer of a configuration file occurs via the USB connection or directly to the SD card. The configuration file is named FSCxxxxx.cfg (xxxxx = Sensbox serial number, including leading zeros) and is located on the SD card in the “system” folder. If the configuration file is missing (new SD card, for example), create an empty file named FScforce.cfg, or download this one from here: FScforce.cfg (click this link with your right mouse key and chose “store target under”). Then insert the SD card into the Sensbox, turn the device on, and off again: The Sensbox will automatically generate a correct configuration file using its current configuration. Copy the new firmware file to the Sensbox via the USB connection or directly onto the SD card, into the “system” folder. 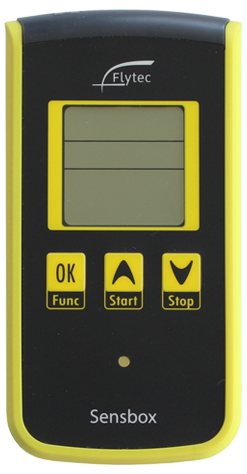 Only one firmware file (*.upg) is allowed in the system folder, otherwise an error message will appear during installation, and the installation process will be aborted. To install the new firmware, hold down the OK/Func button while turning the Sensbox on. The display will show UPG (upgrade) with a moving segment to indicate that the installation is in progress. After the installation, the Sensbox turns itself off automatically.